Survey • Housing First model is credited with positive results. 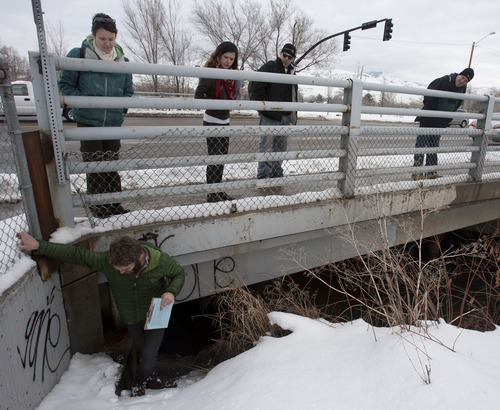 Steve Griffin | The Salt Lake Tribune Road Home case manager, Buddy Tymczyszyn, crawls out from under an overpass that goes across the Jordan River near 600 north as his team members Suzie Whisenant, Stephanie Caya, Josh Holdaway and Tim Keffer look on during the point-in-time homeless people count in Salt Lake City, Utah Thursday January 31, 2013. Each year, during the count homeless people in Utah, are asked where they spent the night of January 30. The survey is conducted mainly between 4 a.m. and 7 a.m. by teams of volunteers who go to shelters and areas where they know there are homeless people camping out. The results of the count and survey help address the needs of the homeless population in Utah. 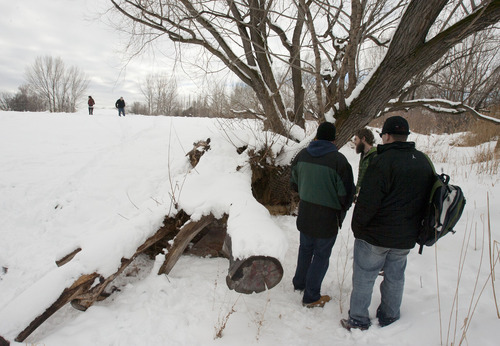 Steve Griffin | The Salt Lake Tribune Tim Keffer, Buddy Tymczyszyn, and Josh Holdaway check out a sleeping area carved out from under a tree trunk along the Jordan River near 600 north during the point-in-time homeless people count in Salt Lake City, Utah Thursday January 31, 2013. Each year during the count homeless people, in Utah, are asked where they spent the night of January 30. The survey is conducted mainly between 4 a.m. and 7 a.m. by teams of volunteers who go to shelters and areas where they know there are homeless people camping out. The results of the count and survey help address the needs of the homeless population in Utah. From left to right: Gordon Walker, director of Utah's Housing and Community Development Division of the Department of Workforce Services, Lt. Gov. Greg Bell and Al Hernandez, director of the VA's homeless program in Utah. 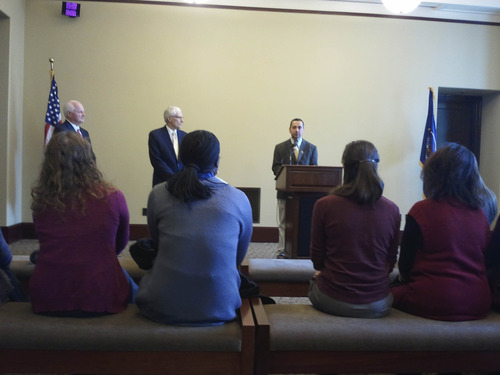 They spoke at a press conference Wednesday about Utah's declining homeless numbers. Steve Griffin | The Salt Lake Tribune Tim Keffer, Suzie Whisenant, Stephanie Caya and Josh Holdaway head out to check on homeless people along the Jordan River near 600 north during the point-in-time homeless people count in Salt Lake City, Utah Thursday January 31, 2013. Each year during the count homeless people, in Utah, are asked where they spent the night of January 30. The survey is conducted mainly between 4 a.m. and 7 a.m. by teams of volunteers who go to shelters and areas where they know there are homeless people camping out. The results of the count and survey help address the needs of the homeless population in Utah. 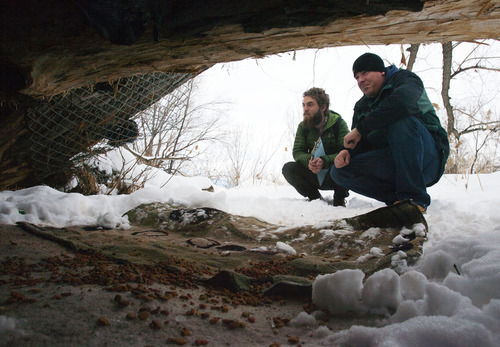 Steve Griffin | The Salt Lake Tribune Road Home case manager, Buddy Tymczyszyn, right, and Tim Keffer, check out a sleeping area carved out from under a tree trunk along the Jordan River near 600 north during the point-in-time homeless people count in Salt Lake City, Utah Thursday January 31, 2013. Each year during the count homeless people, in Utah, are asked where they spent the night of January 30. The survey is conducted mainly between 4 a.m. and 7 a.m. by teams of volunteers who go to shelters and areas where they know there are homeless people camping out. The results of the count and survey help address the needs of the homeless population in Utah. 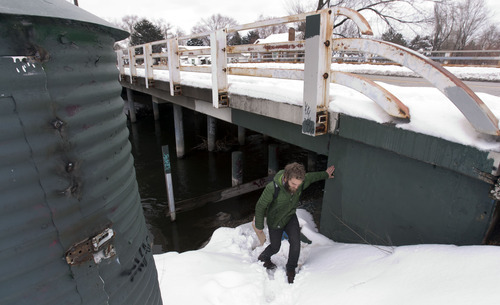 Steve Griffin | The Salt Lake Tribune Road Home case manager, Buddy Tymczyszyn, walks out from under an overpass that goes across the Jordan River near 600 north during the point-in-time homeless people count in Salt Lake City, Utah Thursday January 31, 2013. Each year, during the count homeless people in Utah, are asked where they spent the night of January 30. The survey is conducted mainly between 4 a.m. and 7 a.m. by teams of volunteers who go to shelters and areas where they know there are homeless people camping out. 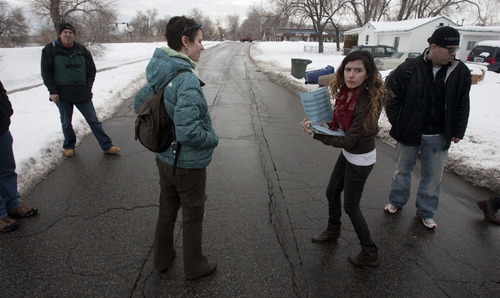 The results of the count and survey help address the needs of the homeless population in Utah. Utah&apos;s homeless numbers are down from last year, according to new data released by Lt. Gov. Greg Bell Wednesday at the State Capitol. The homeless Point in Time Count, required every other year by the federal government but conducted annually in Utah by choice, logs the numbers of homeless individuals on a given night in January. Those numbers are then "annualized" to project tallies for the entire year. In 2012, the statewide homeless population shot up to 16,522, with 542 of those individuals deemed chronically homeless according to the federal government&apos;s definition  someone with a disabling condition who has been continuously homeless for a year or more or has experienced at least four episodes of homelessness in the past three years. But 2013&apos;s count showed marked improvement with the overall homeless numbers dropping to 15,093 and the chronically homeless count down to 495. For the latter, that represents a 9 percent decrease in a year&apos;s time and a 74 percent decline since 2005. "This trajectory is extraordinarily positive," Bell said, crediting the state&apos;s homeless service systems as "quite remarkable." Overall homelessness is also down by 7 percent since January 2012, along with an 11 percent decrease in homeless families. "I don&apos;t know that we will ever end all homelessness," said Gordon Walker, director of Housing and Community Development for Utah, "but with families, the duration averages about 26 days in our state. It&apos;s short." How credible is the one-night count? According to Walker, great pains are taken to log every individual lacking a stable home base at that given time. "We had hundreds participating, searching out along the Jordan River and in other known places for our unsheltered count," Walker said. "We worked with all the known shelters, and asked anyone receiving food at a food bank where they were that night as a double check." is well on its way to effectively ending chronic homelessness within two years. "We developed, in connection with others across the country, a &apos;Housing First&apos; model where we tried to house people if they&apos;re homeless," Walker said. "To solve their problems, give them a house, and that&apos;s what we&apos;ve done." Walker credited the state&apos;s homeless management information system as an effective tool to track the homeless population and identify individual needs. "We know with some certainty the names of individuals who are homeless and where they are," Walker said.Walker also referred to shelter-building as "old technology," adding that the state is moving away from that paradigm. "We know that we don&apos;t want to just shelter people, we want to provide housing and case-management support," Walker said. That support aims to address debilitating conditions such as mental illness and alcoholism, and also connects people with education and job-training to help them get back on their feet. "The end goal is to help individuals better their lives," Walker said, "so that they will come back into society."